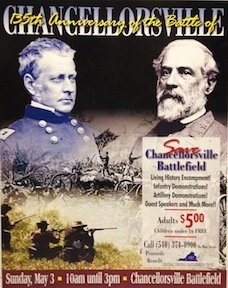 In advance of the Chancellorsville sesquicentennial, I started a series called “Shaping Chancellorsville: How Memories of the Battle Shaped the Battlefield,” which looked at the way in which the Chancellorsville battlefield park was created. I never got around to finishing that series, but the Civil War Trust recently announced that it has helped preserve more land at Chancellorsville—and that offers the perfect opportunity for us to revisit that series AND for me to finish it. The premise of “Shaping Chancellorsville” is pretty straightforward: the story of Chancellorsville as “Lee’s Greatest Victory”—which includes Jackson’s flank attack and accidental wounding—influenced the way the battlefield was created. Ground was preserved if it contributed to that overall narrative, and ground was ignored—and in some instances, allowed to fall victim to development—if it did not contribute to that overall narrative. The story drove land acquisition, which in turn reinforced the story. So, for instance, the property where the battle opened on May 1, 1863, went unpreserved for more than a century and a quarter because, well, frankly, it didn’t have anything to do with Lee’s greatest victory. Once private preservation efforts came into play, the focus changed a bit, but even those preservation efforts were cast in the context of the “Lee’s Greatest Victory” narrative. What other narratives are there, you ask? Well, I’ll invite you to read the first installment of series and see. Part two of the series looks at the first memory memorialized on the battlefield: the wounding of Stonewall Jackson. Part three of the series looks at preservation efforts before the creation of the National Park. Part four of the series looks at the creation of Fredericksburg & Spotsylvania National Military Park and what portions of Chancellorsville were selected for inclusion (and why). Part five of the series looks at the CCC’s work on the battlefield, especially in preparation for the first reenactment held there, and how that shaped the park. Part six of the series looks at the choice of location for the Chancellorsville battlefield visitor center. Part seven will pick up this Friday and look at efforts to begin preserving the heart of the battlefield. The series will continue on Tuesdays and Fridays thereafter for the rest of the summer. I’m excited to be returning to some ground I love so well (ground that I actually live on now). You can read more about Chancellorsville—the battle AND the battlefield—in That Furious Struggle: Chancellorsville and the High Tide of the Confederacy, co-written by me and the inestimable Kristopher D. White. This entry was posted in Battlefields & Historic Places, Memory, Preservation and tagged CCC, Central Virginia Battlefields Trust, Chancellorsville, Civil War Preservation Trust, Civil Wart Trust, CVBT, Fredericksburg and Spotsylvania National Military Park, FRSP, FSNMP, Lee's Greates, Memory, Shaping-Chancellorsville, Stonewall Jackson. Bookmark the permalink.